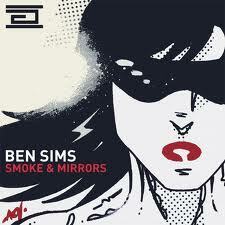 So then, a few decades in the making and the one and only Ben Sims has finally got an album out. Not that he really needed to tread the worn, but still hazardous path of full length dance production work, given his acclaimed, revered, and wholly respected back catalogue of singles, EPs and remixes. And that may very well be the genius of this LP. Because unlike many of his peers, particularly those still sporting fresh faces, here Sims would appear to have thrown caution to the wind by choosing to create something that’s both bang on the autumn 2011 money, while steering well clear of accents that can so clearly pinpoint the era in which a particular track, or collection of tunes, has been made. Those expecting a full blown assault will also be somewhat surprised, though people with any knowledge of the producer’s ethos, and background playing hip hop, will no doubt have expected the end result. Of course we do kick off with the aptly titled Riots In London, a dark Detroit-inspired outing of shimmering white noises, non-stop kicks and a spiralling, acidic hook, but it’s not long before things get lighter, before becoming a whole lot heavier. The Snake clicks and jacks itself into solid UK house mode, dropping filtered vocal cuts over gradually-then-frantically building keys and string refrain breakdowns, providing a definition of machine funk that should appeal to anyone who felt The End closed its doors far too early. It’s a remit taken to even groovier heights with Can You Feel It, the dubbed, bumbling low ends and organ tones therein, and it’s possible to identify plenty more moments, even in the more serious outings on offer. Blake Baxter’s vocal contributions on I Wanna Go Back could be the best example; a weighty, rolling, near progressive and certainly techno number that’s inarguably peak time business, despite the fact one of the most memorable aspects of the tune is its saxophone sample. However none of this should have you believe fans of head in the bassbin pounders will be disappointed, as we edge closer to industrialism with Bullet, and likeminded raw, sledgehammer drums carry the very nu-school Back To The Pod, a track that should be heard by any fans of Blawan and stripped-but-party tech house. Before we leave off it’s also worth noting that if there’s one sure fire soon-to-be-timeless effort on here The Afterparty might just be it, nodding to DJ Minx with it’s delicate, key-changing, plucked melody atop a racing, high energy arrangement filled with atmospherics and go faster hi-hats. For a first album it’s pretty damn impressive, though it seems unfair to judge in such a way given the pedigree producer responsible, proving that patience really is the key to success.